A Kenyan is now at the helm of the African Telecommunications Union (ATU) succeeding Niger’s Abdoulkarim Soumaila. This is the second Kenyan to hold the position after Eng. Jan Mutai who served from 1999 to 2003. 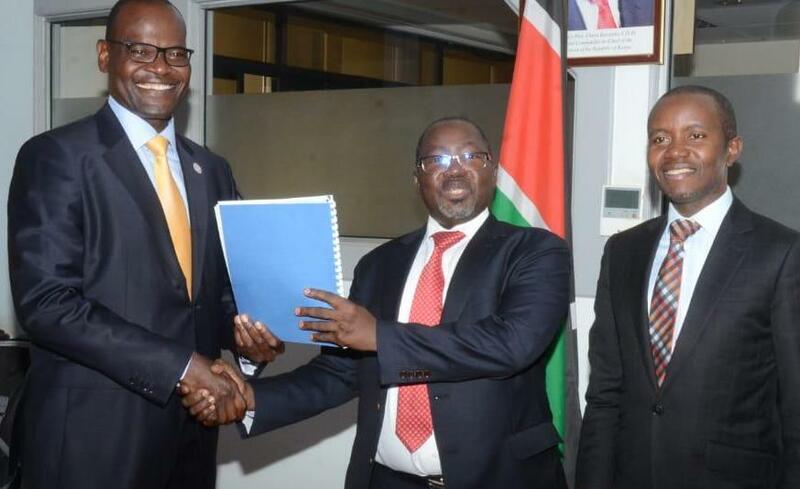 The incoming African Telecommunications Union (ATU) Secretary General Mr John Omo received the instruments of office in Nairobi at a hand over ceremony presided over by the ICT Cabinet Secretary Mr. Joe Mucheru who is also the chairman of the ATU Conference of Plenipotentiaries. Mr. Mucheru said the Kenyan government was proud of Mr.Omo’s achievement expressing optimism that he will steer the continental ICT body to greater levels of success. ‘‘Indeed, Kenya is grateful for this achievement and would wish to remind the incoming Secretary General, Mr. John Omo, to live up to his promise of transforming ATU into a member responsive organization that is also a reference point for ICTs on the continent,’’ said Mr.Mucheru. Mr Mucheru also added that the ATU will be leveraging on technology to break the physical and sometimes artificial boundaries within the African countries and form a single digital market. “Africa is one community and it is our hope that we will continue using technology and the goodwill that we have from our leaders to ensure that we create that single digital market,” he said, adding that ATU has a big role to play in ensuring that Africa has interoperability especially in the area of mobile money. Broadcasting and Telecommunications Principal Secretary Mrs. Fatuma Hirsi said the outgoing Secretary General Mr.Abdoulkarim Soumaila had established a great foundation upon which Mr.Omo will build on to raise the profile of the Union. ‘‘We are confident that with the exceptional experience acquired over the years, Mr. Omo will inject new energy into ATU and build on the good work done by his predecessor Mr. Abdoulkarim Soumala, to catapult the organization to greater levels of success,’’ she said. Mr. John Omo said he was taking the mantle of leadership against a backdrop of challenges facing the ICT landscape in Africa, especially in areas of Internet policy. He added that the Union will work closely with the private sector through collaborations and negotiations. He added that in order to create a robust ICT industry, African governments must set a conductive ICT policy and regulatory environment that attracts investments in ICT, more so in the area of broadband. ‘‘We need to ensure that we build the capacity of our people, whether as policy makers, regulators, operators or consumers to cope with these challenges,’’ said Mr.Omo. The outgoing SG Mr. Abdoulkarim Soumaila said it was encouraging to see many African countries coming together to champion the Africa’s voice in the global information society. He assured his support for the incoming Secretary General. Speaking at a farewell luncheon organized in honour of the outgoing Secretary General, the CA chairman Mr.Ngene Gituku, said the Authority will continue to support the ATU. ‘‘The Authority remains at hand to consistently support any endeavours geared towards improving our ICT environment and want to assure Mr. Omo that we remain at hand as partners in the new journey,’’ said Mr. Gituku. CA Director General Mr. Francis Wangusi said the ATU continues to play a pivotal role in facilitating the delivery of the desired tangible and transformative benefits of ICTs to the citizens of Africa. Kenya has been hosting the ATU for over 20 years now, and during Mr. Soumaila’s tenure, the country has benefited immensely from mutually beneficial collaborations and initiatives that have improved the local ICT sector. ‘‘As a host country, Mr. Soumaila has been on the forefront in support various initiatives that we have undertaken that have had profound effect on the ICT sector,’’ said Mr. Wangusi. Until his election as ATU Secretary General in August this year, Mr. Omo was the Director, Legal Services at the Authority. Last year was a good year for Kenyans as several of them made headlines having emerged top in various posts globally. In March last year, two Kenyan women land top jobs at the African Development Bank (AfDB). The two Stella Kilonzo and Wambui Gichuri have been appointed at the bank as Senior Director, Africa Investment Forum and Director, Water Development and Sanitation respectively. Among them is the former Kenya Electricity Generation Company (KenGen) Chief Executive Officer Mr Eddie Njoroge who is now the new President of the International Organisation for Standardisation (ISO). Eddie was appointed at the CEO of ISO in September last year. In September last year, Global payments technology company, Visa, appointed Marianne Mwaniki senior vice president in charge of Social Impact, focusing on financial inclusion, financial literacy, corporate social responsibility and corporate giving programs.